Carte de l'Isle de Ceylan Pour Servir a l'Histoire Generale des Voyages. 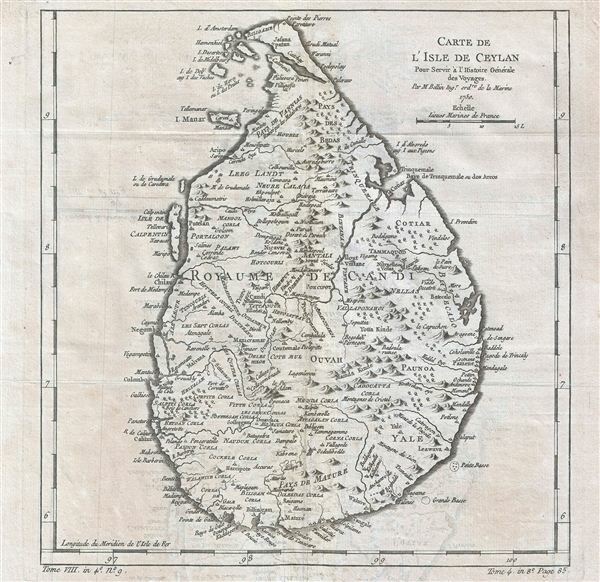 This is a 1750 Jacques-Nicolas Bellin map of Ceylon or Sri Lanka. The map depicts the entire island of from north to south, inclusive of the Isle de Calpetin, Isle Manar, and a group of small islands on the northwest shore. The well-defined coastlines detail capes, bays, and points as well as noting harbors including Colombo, Trinquemale, Chilaw, Negambo, Pamene. Also shows many small towns and villages throughout the island. During this period, control of Ceylon and the rich spice and tea trade that the island represented was hotly contested between the Dutch East India Company and the British East India Company. In 1782, the British captured the port and Fort Trincomalee, establishing a firm foothold on the island that would eventually lead to British sovereignty from 1796 to 1948. This map was created by Jacques-Nicolas Bellin in 1750 for inclusion in Abbé Prévost's Histoire Générale des Voyages. Jacques-Nicolas Bellin (1703 - March 21, 1772) was one of the most important cartographers of the 18th century. With a career spanning some 50 years, Bellin is best understood as geographe de cabinet and transitional mapmaker spanning the gap between 18th and early-19th century cartographic styles. His long career as Hydrographer and Ingénieur Hydrographe at the French Dépôt des cartes et plans de la Marine resulted in hundreds of high quality nautical charts of practically everywhere in the world. A true child of the Enlightenment Era, Bellin's work focuses on function and accuracy tending in the process to be less decorative than the earlier 17th and 18th century cartographic work. Unlike many of his contemporaries, Bellin was always careful to cite his references and his scholarly corpus consists of over 1400 articles on geography prepared for Diderot's Encyclopedie. Bellin, despite his extraordinary success, may not have enjoyed his work, which is described as "long, unpleasant, and hard." In addition to numerous maps and charts published during his lifetime, many of Bellin's maps were updated (or not) and published posthumously. He was succeeded as Ingénieur Hydrographe by his student, also a prolific and influential cartographer, Rigobert Bonne. Provost, A., L`Histoire Generale des Voyages, vol 9 (Paris) 1750. Very good. Blank on verso. Original platemark visible. Even overall toning. Some transference.